Pam's current research interests include leadership in high-poverty schools; ethical and moral leadership; and organizational culture and change. Pam was a multi-award winning teacher and principal for much of her career in public education in Australia. Other positions held include curriculum officer; senior research fellow; director of professional and continuing education (University of Tasmania). Prior to taking up her current position at Western, Pam was Associate Professor, Educational Leadership, University of Calgary. 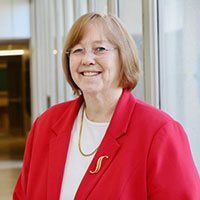 Dr. Pam Bishop, Associate Dean of Graduate Programs and Associate Professor, Educational Leadership, has recently been awarded the distinguished 2017 Willower Award of Excellence from the Consortium for the Study of Leadership and Ethics in Education (which is part of the University Council of Education Administration). The award is called the Willower Award of Excellence in honour of Don Willower from Penn State, who was one of the earliest participants and sponsors of the center's work. The list of recipients since 1996 includes many world class scholars. This year’s selection committee described Pam as "an acknowledged scholar and expert in the area of Values and Leadership, who is highly accomplished in her research and advocacy for social justice and leadership of secondary schools in disadvantaged communities."